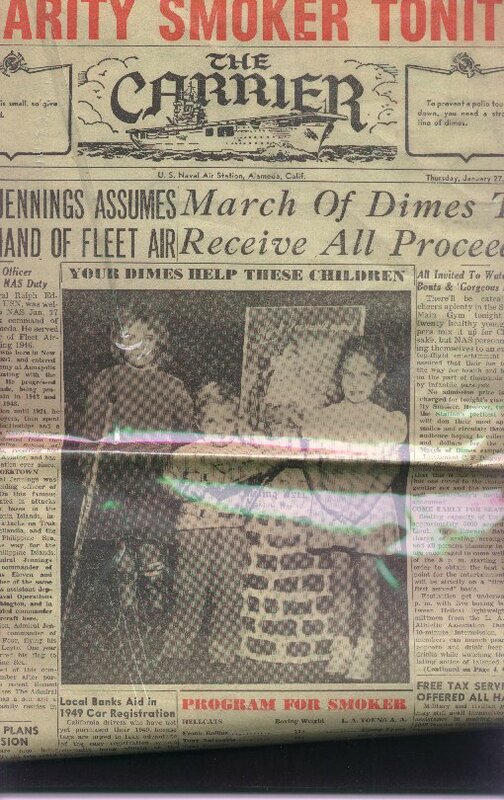 "January 27, 1949 - The Carrier Newspaper - US Navy"
(1178) January 27, 1949 - The Carrier Newspaper - US Navy -Condition: Good Contains the following Articles: Admiral Jennings Assumes Command of Fleet Air, March of Dimes to Receive All Proceeds, Free Tax Service for Hands, USO Club Plans Ski Exursion, plus many more. Paper has darkened, and is folded in the middle. Each page measures 11 1/2" by 16 1/2". Many Black and White Photos with articles. NOTE: Reflection in scan is due to plastic cover on the newspaper. Price: $10.00 + shipping.